You never know how much to believe online reviews but I have to say that the whole service from Fast Interiors from start to finish was brilliant. Our removal guys turned up bang on time and made the whole moving process incredibly easy for us. Also, they both had an excellent sense of humour which helped us relax despite the normal stresses of moving. This is the second time I use this services, it is an efficient, fast and safe company. the employees are always willing to collaborate and very friendly. I give 5 stars because they really deserve it. I would use their services for the third time if necessary. "Thank you fast interior removals and team, they helped me out with the move in packing and dismantling service and provided the storage to store my stuff for weeks until I get the keys for my new house." "Interior removals are Fantastic and professional from start to finish and nothing was too much trouble for these removal guys!! 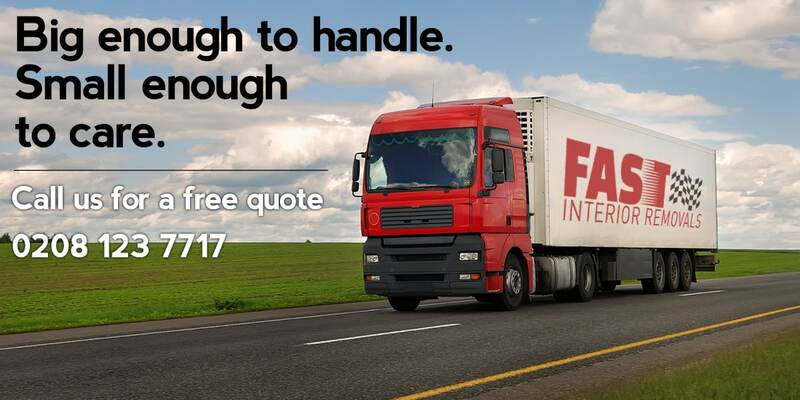 Punctual & hard working operatives who were friendly and very conscientious Great value for money and very pleased with the service"
Thank you fast interior removals ltd to help me last minute with my move. I am very happy with your customer service and removal team thank you. Fast and friendly pack amd move sams day 3 team members worked very hard local move, also help they me to pick up sofa from my mother house to my place last minute really happy with service. We will recommend there services to all our friends and family.Thank you fast interior removals ltd and team! Not cowboys,just honest no-nonsense professionals. With our complete 100% satisfaction guarantee. We are fully insured removal company. We have most friendly staff, call us or live chat with us. Fast Interior Removals Ltd is a vibrant young relocation company that prides itself on the high level of personalized service it gives. We’re London based removal company, over 10 years experience in the removals and storage industry. Fast Movers more than just a moving company, we handle all aspects of relocation tailoring our service to meet your individual needs. We can help facilitate every facet of your move, whether you are moving locally, nationally or overseas. We take care of the logistics of your move, from beginning to end. Let us handle the details and take the stress out of relocating for you. Moving home is considered to be one of the most stressful experiences of a persons’ life. You can rest assured that Fast Interior Removals has the expertise and experience to ensure that your planning, packing and in fact the co-ordination of your entire move will be dealt with in a professional and efficient manner, here is few house moving tips and checklist you should read. Our consultants will be on hand throughout – working with you to ensure that your move is stress free as we can make it. Planning and preparing for an office move is unfamiliar for most people. To make your move a stress-free experience, the Fast Interior Removals offers a complete relocation service with effective planning from the first initial contact through to completion. Whatever the size of your move, be it a large scale relocation or two porters for internal moving, the Fast Interior Removals can develop a moving plan which will be well organised and tailor-made to suit your company’s requirements. 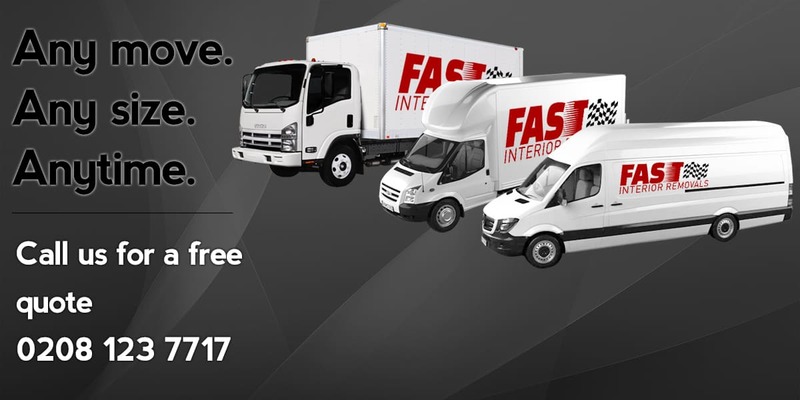 At Fast Interior Removals we are happy to provide you with a simple man and van service for your move. If you’re sure about your needs relating to vehicles, the number of porters you require and how long your move may take please contact us to ensure availability and make a booking. Whether it is your home or a workplace, a place that you have built over a period of time and have settled into accepting it as a part of your life is hard to leave behind. Such is the emotional and mental tool that moving takes place on a person. It is undoubtedly not an easy task to wrap up everything, organizing it, moving it to a different location and then resetting it. Besides the emotions of leaving a space that has grown to become close to your hear, it also exhausts you physically and financially. London is known to be one of the most expensive cities in the world and it is common for most Londoners to rely on rental spaces be it for residential or commercial purpose. Using rental spaces automatically means that a lot of moving should be expected and managing the whole process is often a huge hassle for most people. It gets even more difficult to relocate when you are a larger household with dependents such as kids, old citizens or even pets. That means you have extra work to manage. It is only natural for people to get frustrated during the process and end up managing thing haphazardly which often leads to loss and damages of valuable possessions. This is where a professional moving company with removal reviews can be a lifesaver. London is a bustling city with a lot of activity and a busy life. Living in London for most people means you have to manage work responsibilities to be able to make ends meet, manage your household and your dependents along with a plethora of errands, often without the luxury of a personal car. When you are already juggling with so much on your plate, it is only normal to panic when you know you have to pack up and move to a new place. Moving a house is managing dozens of big and a zillion little tiny things while ensuring everything is organized and packed safely so that there is no chance of damages. The hassle does not stop at picking up alone. Most people in London do not reside in big mansions and houses and apartment units and condos are generally small spaces. Even when you think you manage everything on your own, moving big bulky pieces of furniture or appliances through small corridors does require professional handling. Despite that, many people are still reluctant to hire professional moving services because they believe they will be able to save more money if they can somehow DIY their relocation or ask friends or neighbors for assistance. Many Londoners try to avoid hiring professional moving services in a bid to cut down on relocation costs. However, even if you manage to pull off the who packing up process on your own, it is no brainer that you will need some kind of logistical support so that your belongings can be transported to your new location. This is an ideal opportunity for scammers to feast on. You will easily find men with a van offering freelance moving services and may even instant quote you prices that are dirt-cheap. The rule of thumb is that if someone quotes you a price that sounds too good to be true, it probably is. The last thing you would want is the van carrying your valued possessions vanishing in thin air and nowhere to be found. Even if some freelance van services might not intend to cause you damage or to scam you, but they still might lack the necessary training, skill, and equipment required to handle and move items that need special handling and storage. Either way, it only means a loss that you will have to bear. In such cases, you cannot do much against the van services legally since freelancers are not officially registered and they transport your belongings with your consent. In such cases where no formal contracts exist, you cannot make them responsible for any damages and if its related to Plumbing we highly recommed Tooting Emergency Plumber if you are in Tooting Area.. Despite all the hassles that van services bring, it is understandable that many people would want to use only logistical support and not complete moving assistance. It is a myth that compare moving companies do not offer only van services. There are many movers who offer you a registered and a professional man with a van, that you can use to transport your belongings safely. In some cases freelance service provides might try to lure you by quoting cheaper prices but that is not worth the risk. 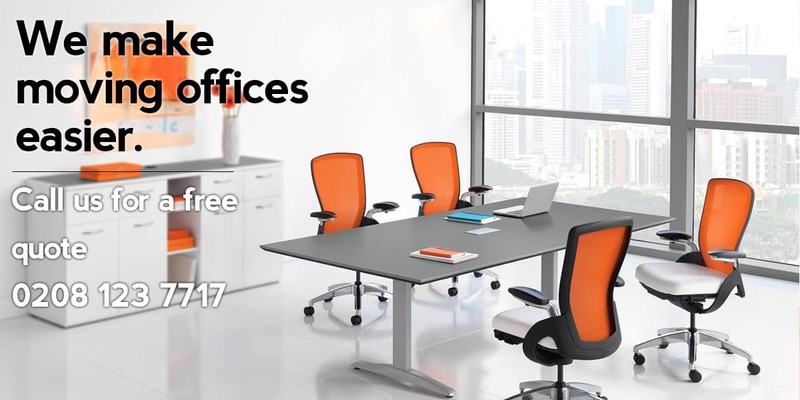 Moving offices and commercial spaces is a different ballgame altogether. Even if it is a tiny software house that you feel is manageable to move without professional help, you better avoid it. Moving a commercial space means you will be handling important documents, computers and storage devices, inventories and many sophisticated items that might need special care. Even if it is business as small as dry cleaning services, you cannot afford to lose or damage your customer’s Armani suit. Therefore, it is highly recommended that you hire professional movers for this job who are experienced in commercial moving. Office and commercial moves often vary in terms of requirement, Moving a restaurant might require a completely different skill set and equipment than moving a software house. Therefore when hiring commercial movers, make sure that the team assisting you to have the right kind of expertise and tools. There are many good moving companies in London that offer packing services as well. Even if you feel you can do well without them, you should consider hiring movers and packers, especially if you are moving to a commercial facility. Not only will it take off a lot of burden from your shoulders and you will be able to focus on other important tasks, but it is also worth to pay the price if it can help you minimize your risk of a loss. You can always negotiate different packages with moving company to figure out something that you might be able to afford. Professional moving and packing assistance will also allow you to not to take days off from work, which means if you choose to not to hire a professional moving and packing services, you might actually lose more money in terms of your income since you will be managing everything on your own. Fast Interior Removals can help facilitate every facet of your move, whether you are moving locally, nationally or overseas. We handle all aspects of relocation tailoring our service to meet your individual needs.